Many middle-aged and older individuals struggle with changes in memory and other brain functions. Several natural compounds have shown outstanding promise and safety for supporting good cognitive function. 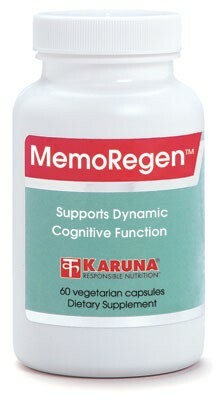 Ginkgo biloba standardized extract (GBE) has been the subject of the greatest amount of research in this regard, but the several additional ingredients of MemoRegen provide even more unique and valuable properties for optimizing memory and other brain functions. Ginkgo biloba standardized extract (GBE) has been shown in human trials to have a significant effect on cognitive function in elderly individuals (Arch Neurol 1998;55: 1409-15). Acetyl-L-Carnitine is an important provider of acetyl groups for synthesis of acetylcholine (Mol Psychiatry 2000; 5:616-32) and promotes the release of this cognitive neurotransmitter (N Engl J Med 1999;341:1670-9). Acetyl-L-Carnitine is an antioxidant with specific protective activity against oxidative stress in the brain (Ann N Y Acad Sci 2004;1033:117-31). Huperzine A, a natural substance isolated from a Chinese moss (Lycopodium serratum) has anticholinesterase and neuroprotective activity (Drugs Aging 2003;20: 981-98). Vinpocetine, a substance derived from a natural constituent of the lesser periwinkle, has antioxidant, blood flow-enhancing, and other neuroprotective properties, and can reduce the loss of neurons due to decreased blood flow (Nutrition 2003;19:957-75). Vitamin E supplementation is associated with protection from oxidative damage to brain tissues (Ann N Y Acad Sci 2004;1031:249-62). Both folic acid and cobalamin (vitamin B12) are important for normal cognitive function in the elderly (Biol Psychiatry 1999;45:1472-80). 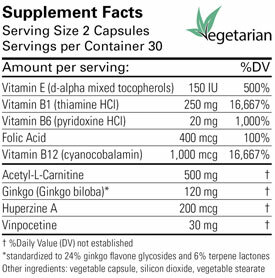 Suggested use for adults: Two capsules daily with meals, preferably morning and evening, or as directed.